Once upon a time, in another lifetime, I lived in Arizona. I lived there for 10 years and met the coolest and bestest friend ever. Her name is Mary, and when I moved away it broke both our hearts because we are like sisters. (but with out all the sibling fighting). Mary and I have tried to keep in touch, but life and responsibilities always gets in the way. Well, we were able to make a pact lately that we are going to try harder to get together and keep our friendship alive and kicking. So, awhile back she flew out here to Boise and stayed and we had the time of our lives! (My husband later said it sounded like a teenage slumber party back in my craft room...and that's exactly what it was!) We hit all the craft stores in Boise and even a few in Nampa while she was here and spent way too much money! Over a couple evenings we decided we would create mini-albums to celebrate our friendship. I wasn't smart enough to take pictures before she left with hers, but I have mine to share with you today. We both fell in love with all the coolio Tim Holtz products out there. It's especially fun when you have someone to share the products with because then you get more variety! Here are some pics, and I will explain as I go along. The theme for the album is all things related to us and our friendship. We also handmade all the flowers on the covers. The binding was made with the coolest stuff. Glassine paper! I didn't know how neat this stuff was. When you crinkle it up it takes on a leather like texture. If you want to make a flower or punch with it, be sure to make the cuts before you crinkle! Throughout the book we added poems and quotes that meant something to us. My husband (the poet) even wrote us a little poem to adhere to the front cover. 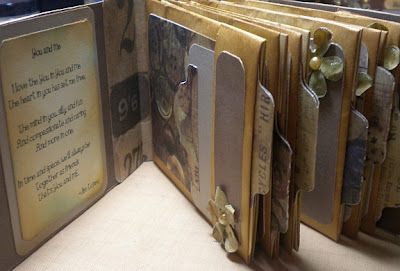 Each page had a mini pocket and tag. 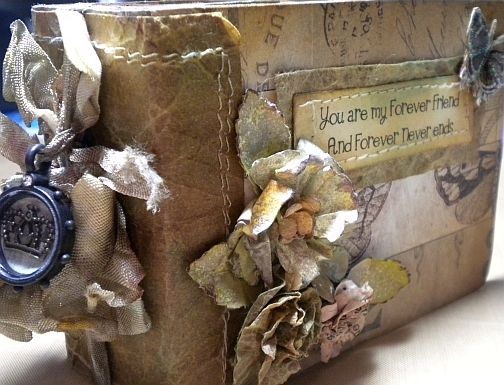 On the larger tags we will add poem, quotes and photos of our fun times together. 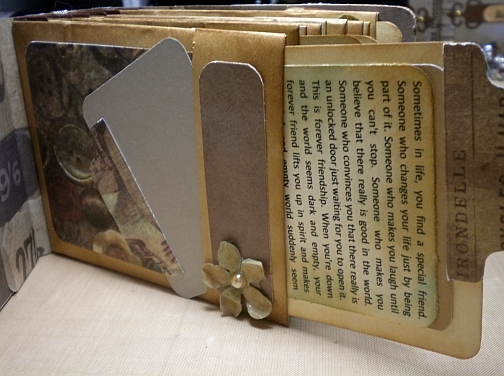 This is sure to be a keepsake with plenty of room for more photos and memories of upcoming adventures together. I hope this inspires you to create something with your best friend and that albums can be more than just photo books. 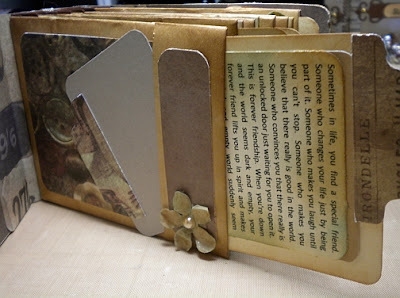 Journal your memories! You will love looking back and remembering. What a great way to celebrate friendship. I know it's been a while now, but I'm glad you had such a good time when she came up. 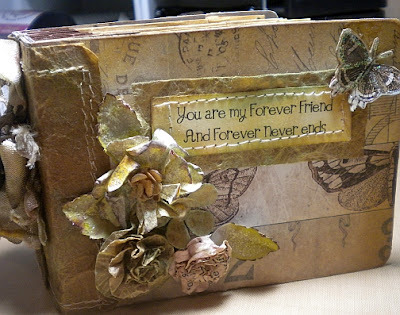 All Things Altered Blog Hop! "Check In" & Check it Out!